I have a rather heretical opinion of the way legendary permanents work, and the way the planeswalker uniqueness rule was changed. In some ways, I would rather they had changed it so legendary creatures worked like planeswalkers used to, because it makes no sense to have Niv-Mizzet the Firemind and Niv-Mizzet, Parun in play at the same time. Although, if you were to do that, you’d basically have an engine where the damage gets you more cards and the cards get you more damage and some of them are also instants and sorceries that get you still more damage. That kind of explosiveness in blue-red spellslinger decks is usually limited to the more glass cannon-like creatures such as Kiln Fiend, rather than the more resilient and generally-threatening ones, so we may as well take advantage of it. 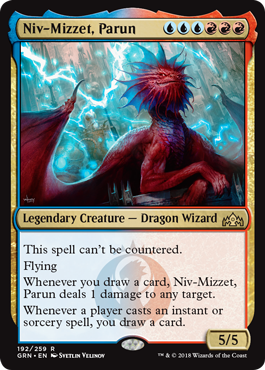 But as befits a creative polymath like Niv-Mizzet, there are few limits on what sorts of decks you can make with him: he’ll often do well when you’re using him as “just” a big flying guy. Everyone’s favorite vain, Izzet-colored dragon makes his third appearance with a similar theme to his past iterations: he likes drawing cards, and he likes doing damage tied to card draw. This Niv-Mizzet is purely the most powerful of the three we’ve seen, because his card draw comes from instants and sorceries. Not just yours, though…any will do to draw cards! One card equals one point of damage, and this also means that Niv-Mizzet is well-positioned with being in blue (which is arguably the best card draw color). Another upshot is that Niv-Mizzet is remarkably resilient, thanks to 5 toughness and uncounterability; he’s still susceptible to spells like Price of Fame, though you’ll still get a card on his way out. He’s hard to answer, and he can take over games on his own. The only downside is his mana cost: it’s still 6 mana, but all six has to be colored! This makes him a hard card to splash for; if you want to play Niv-Mizzet, you’re going Izzet. That said, he is very worth committing to Izzet for, as his raw power and his abilities make it worth it.